Stem cells harvested from heart attack victims' own hearts can be used to repair the injured organ, US doctors have shown for the first time. Los Angeles-based Cedars-Sinai researcher Raj Makkar and his colleagues recruited 31 patients with a history of a recent heart attack. The patients were randomly assigned to either an intervention arm, destined to undergo cell therapy, or a control group who received standard supportive care and rehabilitation. About 2 weeks after their cardiac events, the intervention group of patients underwent a biopsy procedure during which a small catheter was threaded into the right sides of their hearts and a small lentil-sized specimen of healthy heart tissue was recovered. The cells in the sample were then separated and grown in a culture dish where they produced proliferating balls of cells called cardiospheres. From these, muscle cells called CDC s - cardiosphere derived cells - were prepared. Five weeks after their heart attack, up to 25 million of these CDCs were then squirted down the coronary artery that had caused the heart attack and the patients were then followed up using a range of cardiac tests and imaging investigations at 6 and 12 months. Incredibly, the volume of scar tissue visible on scans of the treated patients' hearts had fallen by 12% at the one year time point compared with the control patients in which there was virtually no change. 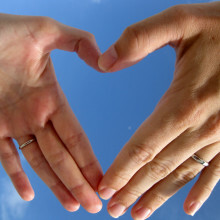 The cell recipients also showed an increase in viable heart muscle tissue and better function of the affected region of the heart, although the patients' "ejection fractions", a measure of the overall pumping efficiency of the heart, did not differ between the two groups and for the moment it's not clear why. But as the researchers point out, these encouraging results based on this small group of patients nonetheless show that the approach is safe and moving to a much larger, more powerful study is warranted in order to explore the full potential of this technique. Chris - COSMOS is a Cambridge University project that's developing a tuneable, portable laser for medical diagnostics and for scientific research. Here to show us how it works is Professor Harry Coles from the University of Cambridge and Dr. Philip Hands, also from the University of Cambridge. Let's kick off with Harry. What actually is a laser first of all, Harry. Tell us about that. Harry - LASER stands for Light Amplification by Simulated Emission of Radiation and it's spelled LASER not the American way, with a Z. The easiest way to think of the laser and how it works is to imagine yesterday afternoon when it was raining. The rain comes down in a random pattern. But if that rain came down and got trapped on a washing line, for example, you'd have a whole lot of drops of water hanging on the line. Then if you flick that washing line, all of the water droplets drop down together. You get what's called a cascade process and because the line is at a certain height, you get the same energy dropping down in the water droplets. Harry - You'd get more energy. So, changing the height of the washing line "tunes" the laser if you like to think of it that way. What you do in an actual cavity in a real laser, you put that light between mirrors and you bounce the light back and forth to give you a gain in a single direction. Chris - Obviously, lasers don't have washing lines in them. Chris - What do they use to create the metaphorical washing line? Harry - That is the molecule or the system itself where [you can excite the molecule]. So you excite electrons to a higher energy level. That's the analogue of the water droplet and then as the electrons de-excite, they give light out, they give photons out. Chris - And they could only have discrete energy levels, so they have to give light with a certain colour. Harry - That is correct, yes absolutely. Chris - So how do you actually stimulate the emission of the radiation? What does the shaking of the washing line and actually makes more light where there was less to start with? Harry - You can do it two ways. In our systems, we drive the laser with a pumped diode system to get light in to excite the system. You could do it electrically. For our application, we don't do it electrically. We want to use fairly low energies because of medical applications we'll talk about later. We don't want high powered lasers. Chris - Philip, so why is this special - what you've actually invented? Philip - Well what we got here is a particularly small and self-fabricated laser and in my hand right here is the business end of our laser. It's just a small glass cell - two pieces of glass separated only 10 microns apart. In this cell, we have a tiny amount of liquid crystal material and this liquid crystal material acts as both the gain medium, the washing line to use Harry's analogy but also, as the mirrors of the system. In one small compact easily fabricated thing we have almost the entire laser system, all we now need to do is to excite it with a form of energy from the pump source. Chris - So you have a laser which you put energy into your new laser cavity with, so that's the source of the energy in the first place, and that then produces new laser light of whatever frequency you want to. So the breakthrough here is not just the miniaturisation but the ability to create light of any colour you want? Chris - The previous laser cavity would be dictated by a certain height of washing line - those atoms in there. You can get around that problem and produce washing lines of any height. Philip - That's right. There's a certain range of operation, but what we can do with this laser is we can take a fixed wavelength pump source and convert it into an any colour laser output specifically from the range of about 450 to 850 nanometres, that's all the way across the visible spectrum. Chris - That is blue right through to red. Philip - And into the near infrared a little bit as well, yeah. Chris - So you've got it set up in front of us. Can you just talk me through what I am seeing here? Philip - This unit in front of me right here is the laser itself. You can see it's in two parts, the modular design. The largest part is actually the pump delivering energy into it. But the small box at the end here contains a liquid crystal cell which is like the one I've got in my hand right here. We shine light onto that crystal cell and it simply emits laser light. At the moment, you can see it's focused onto the spot card here. It's emitting red light because the twisted molecules that are inside our liquid crystal have a certain helix that reflects and therefore resonates red light. However, if I translate the cell across, I move a different part of the cell in front of the beam where the helix is more tightly wound and it now reflects and resonates green light. Chris - So liquid crystals - the same things that might be in the TV in your living room these days, and calculators once upon a time - those are the display molecules. You're using certain configurations of those to cause the light to go through these contortions that produce the different colours. Philip - That's right and inside the cell, there are three basic components. There's the dye itself which is the emissive part, the part that absorbs the radiation and emits the light. And then we have what we call a chiral nematic liquid crystal. It's a twisted structure at a molecular level and that acts as a resonator of our laser. 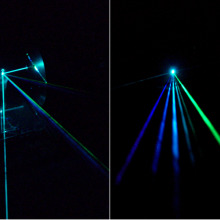 The amount of twist that we give it determines the resonant wavelength and therefore, the emission colour of our laser. Chris - Are all of the crystal architectures premade on that little chip or do you actually, using electronics, change them dynamically? Philip - Well the structure itself forms spontaneously. It's important to say that first of all, all we need to do is mix the component ingredients together in a test tube and then fill the cell. That spontaneously forms the right structure. If you want to change the helix, you can do so in a number of ways. One is chemically: we can just change the ratio of our mixtures. You can tune it electrically to a certain degree as well. We can get about 100 nanometres or so of tuning electrically. What I'm doing here is a mechanical tuning. We've got a variation in the helix across the cell and as I press the button, I can tune the wavelength from red to green. Chris - Shall we see it change? Chris - So you click a button on your laptop which talks to the device. Chris - It's becoming yellow. Philip - ...I come through to green. That's the range of this particular demo. We can actually go all the way through to blue and as say, into the infrared as well. Chris - Philip, thank you. Harry, so why did you do this? What do you actually want to use this for? Why is this a big breakthrough? Harry - Because every molecule has a different chemical structure and therefore has a different signal. So if you want to look at a whole range of different materials, it might be a biological system, then you will have absorption at different wavelengths, different colours, and you can look at systems naturally. In this case you don't have to put fluorescent dyes into your material. You can look at their natural absorption and indeed, their natural fluorescence. Chris - So if you are a scientist using a microscope in a laboratory where previously you'd have to label cells with something that you would then flash light a certain colour onto to make it glow, now you're saying, you can just tune up your laser into the microscope, choosing a particular wavelength that will make things that are naturally there anyway glow. Chris - So you don't have to add anything. Harry - Absolutely. All proteins that are in biological systems fluoresce beautifully in the blue violet. So you can pump that system and look at the output signals. Chris - And because it's so compact, you could - I presume, take that on the road, put it into a surgery, if you're looking for a certain substance in the blood, you could do that very easily. You wouldn't have to have loads of equipment. Harry - That's right. One of our aims is to develop these lasers for developing countries where we'd have portable devices, battery powered to use in the field - for malaria detection, things like that. Helen - It's a black box. It's 20 centimetres tall, 5 centimetres wide, and currently, you might just be able to hear it. The little fan is going. It's projecting a beautiful clear image onto the desk in front of us. And I think you've just been playing a game on it! It's doing all sorts of different things and I want one. Maybe you can start off by telling us why you made this particular thing and what kind of things it can do? Nic - The light touch is probably best thought of as having all the functionality of an iPad but without a physical screen. Nic - It acts just like a touch screen, except the table becomes the touch screen itself. We created this really as a development of some technology which we developed when the four of us who started the company were in Cambridge University, in the engineering department. We'd all been doing our research on the use of lasers and in particular, steering lasers using liquid crystals. The reason why that's interesting and has real applications is that all of us were excited about the idea of having a mobile phone or a really small gadget from which you project a large image. You see it in all the films and the fundamental problem really is one of efficiency. Most display technologies waste most of the light because when you form an image, you block the light. If you're using lasers and in particular, if you're using holographic displays like we are here, then what you do is you have the opportunity to steer the light to where you want it. So you create light and dark not by blocking light and wasting it, but by steering it to where it's needed. The company Light Blue Optics was really formed around that technology on ways to do it efficiently. Helen - So how are lasers being used in this gadget to get the image that we're looking at? I'm currently very pleased because of the beautiful picture of a turtle coming out which is very suitable for me. How are you creating that image and where do lasers come into it? Nic - In the system, we have three lasers - one red, one green, one blue. They are turned on and off very quickly and they are used to illuminate a very small liquid crystal on a silicon chip. And on that chip, we don't put pictures. We put what look like random patterns and of course, they're not, they're diffraction patterns. When the light hits the display and it's reflected, the LCOS (Liquid Crystal On Silicon) chip, as it's called, it changes the delay of the light at different points. That causes the light to interfere with itself and by the process of diffraction, as you travel a certain distance away, that forms a pattern. And of course, what we're trying to do here is to work backwards from the pattern, which is the image, to try and work out what diffraction patterns we need to put on that chip. Helen - So how do you do that? How do you create those diffraction patterns? Is that something that I'm going to be able to grasp? Nic - You get some very clever scientists, put them in a room and feed them pizza. Helen - Pizza, okay. Got it! Nic - Basically, some of my colleagues, very talented in the maths area, developed some algorithms for doing it. It's a very hard computational problem and what we came up with was really a way of cheating. So, if you understand how your eye works, it forms an image over time. What you see is not just an instantaneous pattern but it's the integration of lots of separate patterns. What we did is work out how to produce approximate versions of the image very quickly and different versions of them and if you display them very quickly, you fool the eye into seeing a high quality image, and that was really the fundamental breakthrough that some of my colleagues came up with. Helen - And you mentioned already that it's about efficiency to get a really bright image. Why is it that lasers are better than using other things like lights or LEDs, things like that? What's going on there that's making this brighter and more clear and beautiful than perhaps an alternative? 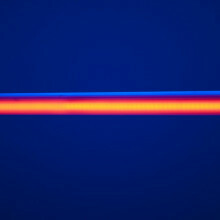 Nic - From an image point of view, lasers are great because you can get very deep and rich colours. You can address a very large amount of the colour spectrum. But the real advantage over LEDs and things like that is that you have more control. You could control not just the amplitude, how much of it is there, but the phase. And by doing that, that's what allows you to steer it, that's what allows you to design very compact optics so you can shrink the system much more. Helen - And I've been playing with this, moving things around with my fingers. It's a touch screen. That's also based on laser technology as well, isn't it? That was something that already existed and you've added it in so that, although this is not just a screen, we can touch and move things around as well. Nic - Yes. The concept has been around a while. In the past, you've been able to buy laser keyboards where you could type on the table. We started there and we've adapted and improved the technology. So it uses an invisible infrared laser and as you touch the screen, there's a camera in the system that sees reflections and that's how the touch works. Helen - You mentioned to me just before we came on the show that this particular box isn't actually available anymore because you're doing the next generation of things, but what has this one been used for? What sort of applications? Where might we see this around and about and what sort of things is it doing? Nic - When we set out designing it in the first place, we thought of it as a consumer device and in actual fact, your customers will always tell you differently what they want to use it for, and most of them wanted to use it for restaurants and bars so people could sit at the table and order the food and drinks themselves. Helen - So I could look and see what would I want and I'd press the button and then that would go straight to the kitchen and tell them what I wanted to order. Nic - Exactly. And the reason is, if you had an iPad doing it and you have ketchup on your fingers, then that's pretty gross. Helen - That is gross. I hadn't thought of that. Good point. Are they also installed in some fast-food restaurants where you can play games on them? Nic - That's right. Those are couple of pilot stores in the midlands that built these into the tables and apparently, they had to almost install a ticketing system for the kids to ration them. Helen - Excellent! But you're moving forwards. You're looking at the next generation of these gadgets. What's next for the laser touch screens? Nic - We're pretty excited about the next version that's being developed. It's mainly being developed in our office in America and it's really a continuation to principle. Making even smaller systems, small enough to fit inside a very slim phone, even more efficient. The idea is it's something that will allow you to take your iPhone of the future and project a large image using virtually no battery, and maybe even do the touch as well. Helen - Thanks, I look forward to finding a way of watching movies! Fish can distinguish between two groups in the same way as humans. A new study reveals that undergraduates and fish have a lot in common - at least when it comes to counting. The old wives tale that fish have a seven second memory has been well and truly blown out of the water, with findings emerging that fish in fact have all sorts of elaborate behaviour; they can recognise, copy and deceive each other, and it turns out they can count. 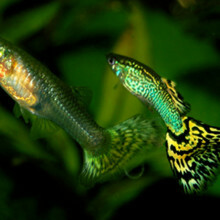 Christian Agrillo of the University of Padova in Italy led a team of researchers who put the counting skills of guppies and human students to the test by asking them to pick the larger of two groups of things. The undergraduates were shown a cluster of between 1 and 24 dots on a screen. One group of dots were flashed up for 150 ms followed by a second group for the same length of time but of a different number. The students were asked, without counting out loud, to choose which of the two groups had more dots. The fish were tested by being offered a choice of who to hang out with - it's already known that guppies are quite sociable creatures and if they have the choice they prefer to join a larger shoal. The experimental fish were put in a glass tank resembling a miniature soccer pitch, with two shoals visible in each goal at opposite ends. The research team then watched them for 15 minutes to see which shoal they spent more time close to. It turned out that both fish and college students performed almost identically in their tasks. They were both better at correctly picking the larger group of dots or fish when the ratio between the numbers was high e.g. they found it easier to distinguish between 24 and 4, than 24 and 20. This only mattered up to the number four - below that, the ratio between the two numbers made no difference on their ability to pick out the larger group. Discriminating 3 from 4 was as easy as discriminating 1 from 4. The fact that humans can do this should come as no great surprise - other primates have shown similar abilities. But the finding that guppies do it too is certainly intriguing, especially if you consider that primate brains tend to be around a thousand times bigger than their fishy counterparts. Being able to distinguish different sized shoals could clearly have an advantage for fish, but the study raises various questions about how these counting skills originated and whether it's independently evolved several times. But as the authors suggest in their paper published in the journal PLoS One, these findings might hint that no matter how bad you think you might be at maths, our modern ability to do sums and count could have evolutionary origins way back among the ancestors us primates share with fish. Chris - This week, one of the world's fastest computers just got 10 times more powerful. It's called HECToR - Edinburgh University's building size supercomputer - and it now has over 90 terabytes of memory and it can do 800 million million calculations every second. It's intended to help UK and European researchers to solve some serious scientific problems including things like forecasting the impact of climate change in the future, and predicting the spread of epidemics, and maybe even developing new drugs. Our reporter James Harrison has been to Edinburgh to meet HECToR for himself. 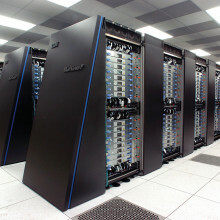 Arthur - Well this supercomputer is capable of doing some 800 million million calculations per second. An easier way to think of it is maybe to say that it's 100,000 calculations per second for every man, woman and child on the planet. HECToR also has an enormous amount of memory. It stores the data on disk just like in your laptop except it's got a petabyte of disk space. That's 1,000 million million million million bytes worth of disk. If you have this much in your iPod and you stored music on it, and started listening today, you'd finish in the year 3153. James - Until more recently, scientists spent much of their time testing theories and ideas by experimentation. But now, with the availability of such facilities as HECToR, adding the power of supercomputing has moved science to another level altogether. Arthur - The climate is an obvious example of this. You don't want to experiment on the world and the theory is just too complicated. You can't sit down with a pencil and paper. So what we do with a computer is we take those equations that we know and we solve them using the computer to do what the scientist with the pencil cannot. That is to dissect the world, if you like, so that we solve the climate or the weather for a little bit of Edinburgh, a little bit of London, and you stitch them all together to produce a picture of the entire globe and then run that forward for the next 100 years and try to get deeper understanding. It's a complimentary approach to doing science. There are some 50 different research groups from around the UK that are using the facility. They span the range from biology and drug design through engineering, chemistry, and all the way to the environment. James - The running of HECToR is managed by the Engineering and Physical Sciences Research Council on behalf of Research Councils UK. Being able to predict the effects of global climate change or the way bones are formed were once considered impossible tasks, but now, supercomputing is helping scientists in the UK and around the world work toward solutions. Dr. Carole Morrison is a senior lecturer in chemistry at the University of Edinburgh. Carole - So an example of where the work we're doing fits in with medical science is in looking at the disease pathways of things like Parkinson's and diabetes for instance. Both of these diseases, the mechanisms of the disease at the atomic level, depend on knowing what hydrogen atoms are doing, the protons. So, these are responsible for dictating the pH of your cells, for instance, because you can transfer hydrogen ions in and out of chemical cells and they're also involved with energy transfer, and so on. If you can understand how hydrogen ions can get in and out of cells, then it will allow you to be able to say something sensible about the reaction mechanisms of these diseases. That then opens up the possibility of being able to design new drugs and so on that might help in the cure of these diseases. James - But just as with our own personal computers, this technology isn't standing still. Arthur - We're just about to move on to phase 3 of HECToR which is going to be roughly 10 times the performance of HECToR when it started. This opens up a whole series of new problems that we can start to deal with. James - And for Carole Morrison, while HECToR's current processing power has already produced important answers in the study of molecular interaction, the next phase of HECToR promises to build on those results, allowing future scientists to produce models that will get even closer to solving the world's biggest disease related issues. Carole - Phase 3 HECToR will allow us to be able to expand on our model. We want to adapt it. We want to modify it to make it even more realistic. You write up your work, it appears in a journal, you publish it and who knows, maybe somebody somewhere will read it and it will be that piece of the puzzle, that clue, that they need to be able to take our understanding of diseases like Parkinson's, like diabetes to the next level. Helen - Dr. Carole Morrison at the University of Edinburgh ending that report on the next stage of the development of the HECToR supercomputer launched this week by science minister David Willetts. 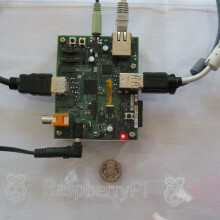 Chris - Raspberry Pi is the size of a credit card. It will sell for about 20 quid and it would turn your TV into a home computer, and the first units are set to arrive in Britain this week. With us is the co-inventor David Braben from Frontier Developments in Cambridge. Chris - So tell us. What was your vision for this when you first thought about creating this incredible miniature computer? David - What we're trying to do is to bring computers to a lot of people who currently have access to computers maybe at school but don't have access to programming them in the same way. In an awful lot of computers these days, it's very hard to actually get at them as a device for programming. They are very much more devices for consuming software. One of the problems is that a lot of kids at school are put off using computers because ICT is very much how to use office skills and that sort of thing. So they presume that's what programming is all about; which it isn't, programme is exciting, it's fun! You can do science, you can create things, it's really good. But at the moment, with computers, it's very, very easy to muck them up and by that, I mean to stop them working because you've brought in a virus, that sort of thing. The point about Raspberry Pi is essentially, we think it's one of the first stateless computers for a very long time, in fact, since the days of things like the BBC micro, nearly 30 years. The point with that, apart from the Mac Address, when you first switch it on, they're all just the same. If you remove the SD card, there's no state in it. Chris - How does this actually work? How have you managed to get this so small? David - One of the great things with the electronics industry over the last few decades is that electronics have been shrunk and shrunk, and shrunk, using less and less power, particularly for the mobile phone business. So we've really piggy backed off that. The chip that's at the centre of Raspberry Pi is a chip made by a company called Broadcom here in Cambridge, or designed here anyway, which has an ARM chip in it, also from Cambridge, that is small, low-powered, and also, not very expensive. Chris - And when someone buys one of these things, and 20 pounds sounds like an incredible price point for what you'll be able to do, they'll plug this into their television. How do they then interface with it, keyboards, mouse, and so on? How does that work? David - Yes, you can plug in. It's got USB sockets in it so you can plug in a keyboard, you can plug in a mouse and there you go, you've actually got a full computer. You can do email and things like that, whatever you would do on a normal PC, but you can power cycle it very, very quickly. We've taken a slightly different philosophy where, yes, bad software might come in, you might do something wrong, you might mess it up temporarily but you press reset and less than 10 seconds later, you're back up again running with a fresh version of the machine. Chris - You were brought up the BBC Micro computer and that's where you made a huge name for yourself with a game. I know there are people in this room well including me who will have played Elite which you pioneered, and we're still totally amazed that you managed to do with 32K, what you did in that game. It took people a long time to catch up. What language will this run? The BBC computer was so amazing at its time because BASIC, the language it ran was so accessible. It was so easy to learn and it got you into it. What will you do with this? David - Well actually, two of us wrote Elite, the original, back in '84. What we do with this is we want the first versions, that ones that are going out this week, to be developer versions so we're providing lots of different ways of using it. What we plan is that later there'll be a version that will be a lot more kid friendly. There are several approaches, and what we want to do in the meantime is work out which is best. And one of them interestingly is actually BASIC, the original BBC BASIC, because to be honest, learning is what's important and actually, it's a really good system to learn with. Chris - So you'll be able to get it to run BBC BASIC. This should get legions of kids programming. Is this who you're aiming this at and we're going to try and get school kids countrywide - just Britain or worldwide - to plug in on this because it's so cheap and it's something they can play without really messing it up. David - Our initial aim was just Britain but I think worldwide is very hopeful. We've been approached by charities and all sorts of other people. The aim isn't just programming. It's doing creative things with a computer and really to break down the barrier, using the computer as a tool which is something we saw a little bit of excitement for in the 1980s, but that's sort of gone away. They're seen as really dull things and what's amazing is if you talk about it to a kid, you say "would you like to make an app?" then they go, "that's what you mean! That's sounds a lot more interesting." I think that's the distinction. Chris - The first units arrive tomorrow in Britain, we hope. What will you do with them? How will you scale the project up to then optimise it and then start marketing it? David - We're hoping, assuming they all work fine, to be actually sending them out this week. We have a plan for increasing the scale of what we're delivering over the next few weeks and months. We think it's very, very exciting. We have a good feel that the demand is high. We don't actually know how high it so it's actually very exciting on that side as well. Chris - I know you said it's a foundation but is it actually a business as well. Is there an aim to try to make money so that you can re-invest that in the development of this thing or make a profit? What's the model? David - We are a charity, but that doesn't mean we can't make a little bit of money on each unit. It's a very small amount and we will be ploughing that back in to make the thing better, to produce what we can, and also to support it because the other part of this is to support an online resource so that children, teachers, parents can upload things and download things to make it become a of self-supporting community which I think could be really exciting. 32:15 - Virus detection, fighting parasites with alcohol, drugs on a chip and tiny chameleons! Virus detection, fighting parasites with alcohol, drugs on a chip and tiny chameleons! scientists at the University of Leeds. Current testing methods involve identifying the genetic material of a virus in samples in the lab. But now, working with adenoviruses, Paul Milner has developed a biosensor formed from antibodies and electrodes that reveal not only the presence of a virus as but also the number of virus particles present directly from a patient's sample. Paul - The antibody binds the virus, this changes the surface of the electrode and it changes various properties of the electrical current that passes across that electrode. The key point about this is there's no processing. It's literally put the sensor into your sample, that's your measurement! This is about speed and ease of use. So you could easily do these tests in a doctor's surgery or for some conditions even at home if it was something you have to monitor frequently. Fruit flies use alcohol to self-medicate against parasitic infections. Larvae of the common fruit fly Drosophila Melanogaster feed on microorganisms found on rotting fruit, exposing them regularly to a high intake of alcohol. The larvae are also vulnerable to infection with parasitic wasps which eat the flies from the inside out and cause death. But now, infecting fruit flies in the lab and exposing them to food containing alcohol, Todd Schlenke from Emory University found that flies infected with wasps purposely consume high doses of alcohol which poisons and kills the parasite. Todd - Infected flies chose alcohol food at about an 80% rate whereas uninfected flies chose the alcohol food only at about a 30% rate. So flies that are infected, they realise they're infected and they seek out alcohol to try to cure their infections. These animals out in nature have really, really complex behaviours that can help them fight off infectious disease. We probably unknowingly have similar kinds of behaviour. Alcohol might actually act as a protective toxin against infectious disease and something that should probably be followed up in other organisms. deliver drugs in patients with osteoporosis. Ensuring patients take their drugs on schedule and at regular intervals can be a challenge when treating many medical conditions. Robert Langer and colleagues from the Massachusetts Institute of Technology, have overcome this with the design of a chip, implanted under the skin and activated wirelessly, to deliver doses of a drug into the bloodstream at precise times. Clinical trials delivered a parathyroid hormone, used to improve bone density, in 7 female volunteers with osteoporosis but the technology has the potential for a range of applications. Michael - This is the first time that implanted electronics have been used to deliver drugs. There are many applications for potent drugs that require subcutaneous injections - MS, diabetes, reproductive health, human growth hormone treatments - so there are many diseases that are treated with very potent drugs like the ones we're able to deliver with this device. And finally, Some of the world's smallest chameleons have been discovered on the island of Madagascar by researchers from the Zoologische Staatssammlung in Munich. Four new species were identified by Dr Frank Glaw as they moved from their daytime dwellings of leaf litter and climbed onto branches or leaves to rest at dusk. 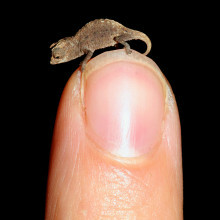 The smallest of the group, Brookesia micra is one of the smallest reptiles known and reaches a maximum of just 29mm in length. Frank - It seems that miniaturisation of animals on small islands gives them a new ecological niche. The competition for example of invertebrates, of spiders, or minor invertebrates are not existing in these islands. And so, these animals can evolve into this particular niche that might otherwise on the mainland be occupied by larger animals. 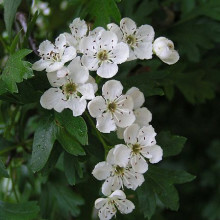 Chris - In England there are 450,000 kilometres of managed hedgerows, often containing hawthorn and often dubbed "corridors for wildlife" - be it beetles, bird, butterflies or even dormice. Most farmers trim their hedges every year. But now new research by DEFRA and Natural England involving Dr Jo Staley, from the Centre for Ecology and Hydrology together with independent hedgerow consultant Nigel Adams has shown that less frequent trimming is best for wildlife. Planet Earth podcast presenter Sue Nelson met up with both of them at one of the sites on the Waddesdon estate in Buckinghamshire. Jo - The research that's just been published shows that if farmers cut their hedgerows every three years, that can have a substantial benefit for wildlife. It results in more berries being produced for over-wintering birds and small mammals to feed on and also in more flowers being produced in the spring for pollinating insects. Sue - How significant an increase in provision for the wildlife was there? Jo - We were comparing cutting every two years or every three years with cutting every year, and we found that particularly the cutting every three years has a huge benefit. We're finding three and a half times as many berries as on the plots that were cut every year and we're finding twice as many flowers as on the hedges that were cut every year. The plots that were cut every two years had a sort of intermediate benefit, but there we were finding that the timing of cutting was absolutely critical. So in order for there to be an advantage to cutting every two years in terms of increasing berry abundance, these hedges really have to be cut in late winter rather than in the autumn. So the hedges are there during the winter at the critical time when the wild life needs them. Sue - And what sort of knock on effect then would this have on wildlife that use hawthorn hedges? ...I've just stopped a couple of over-wintering ladybirds here that are hiding in a crevice in the hedge, so that shows how even some of the more common species do rely on the shelter of the hedgerow during winter. Sue - Let's go through to the unmanaged bit - oh yes, are these sloe berries? Jo - That's right. So these are blackthorn berries. We're standing next to a bit of a hedge here that hasn't been trimmed, so this is the bit that will be cut next year as part of our 3-year rotation and there's a nice patch of sloes here which are still providing food for birds and for small mammals that want to come along. Especially on a really frosty day like today, they may not be able to get into the ground to search for worms and things so that's when these berries become really important. Sue - Nigel Adams, you're a hedgerow consultant, you were involved in selecting some of the sites that are being used to extend the project. For you, is this a sort of vindication of the benefits that a hedgerow can bring, but through better management can actually improve it? Nigel - Most certainly. If we start with the point that hedgerows are one of the most important and understated habitats in the whole of the country, and yet if we cut them every single year at the same height, we are liable to destroy the potential that they have. So this research, as Jo has said, is looking at two-year and three-year cutting - not only for the over wintering fruit and berries but even the blossom in the spring is very important for invertebrate populations as well, so it's crucial. We only have to have a look at hedges that haven't been trimmed for years and the vast amount of berries that are on them and the flocks of redwings and fieldfares that come down on them in the winter to see that something is going on. So we're just trying to encourage farmers not to trim every year. But so much money is being spent on this policy of giving farmers help towards that, that we need to get that right and we need to look at whether perhaps if we're trimming every two years, but we trim in September immediately after the harvest of that second year when the ground's dry and the farmers want to get in, they've got an opportunity to get on the field, get it trimmed and that's it. But is that money well spent because of course they're taking off that fruit potential for the over wintering birds right there. So we've got to know whether that is working or do we need to go into the three-year trimming. Sue - Nigel, when an organisation like Hedge Link receives backing through scientific research, that a certain way of management is beneficial for wildlife, does this make it easier for you to advise people in terms of how to manage their hedgerows or do you find that people don't want to know? It's their hedge; they trim it, job done. Nigel - I think it's a delicate balance. You certainly do need the scientific backing and the facts about what you're doing, you just say well this works and this doesn't work. But also pure science can sometimes turn landowners off, dare I say, in the sense that they want a practical way of doing things and practical outcomes. So you have to tie the two things together; very practical advice but backed by good science. Chris - Sue Nelson on the Waddesddon Estate in Buckinghamshire speaking with Dr. Jo Staley from the Centre for Ecology and Hydrology, and Independent Hedgerow Consultant, Nigel Adams. Emma - We're in Artemis. It's the CLF's facility for ultrafast laser and XUV science. So we have a big laser system that produces really, really short pulses of light, 30 femtoseconds or so and we use that to generate pulses of XUV which is radiation in the region between the UV and the x-ray region. So, at 10 to 100 nm or so. Ben - In order to come in, we've had to don aprons and shoe coverings. We've just walked across a sticky floor, and we've got goggles on. Obviously, there are a lot of safety issues but I'm guessing the aprons and shoes are not for my safety but to stop me from contaminating the laser? Emma - They are, yes. They're trying to keep down the amount of dust in the lab. If you get dust on some of the optics, the lasers are intense enough that they can actually burn the dust onto the optic and make a hole in the laser beam. We also use a lot of ultra high vacuum equipment as well. We generate the pulses of XUV in a vacuum and then all of our experiments are done under very high vacuum as well. It helps keep the lab cleaner. Ben - So the lasers in this room are at x-ray strength, but we're still wearing goggles. Surely, x-rays are going to get straight through goggles and affect the rest of our bodies just as much as our eyes. So are the goggles really necessary? Emma - The lasers themselves generate light at 800 nm which is just on the red end of the visible spectrum. There's also a lot of green light around from the pump lasers that put the energy into the titanium doped sapphire crystals that actually emit the 800 nm light. So those are the main things that the goggles protect us against. The x-rays that we produce are in the vacuum ultraviolet XUV region of the spectrum. So basically, they're absorbed in air. So we generate them in vacuum and through most of their journey they're inside a vacuum chamber with stainless steel walls. The x-rays are the least of your worries in this room. Ben - So, the x-rays that you're using for science essentially an end-product and these goggles protect us from the other lasers that you use to create those. Emma - That's exactly right, yes. Ben - It's very noisy around here as well. Is that just the pumps for the vacuums or are there other bits of kit that are making that noise? Emma - The noise you mostly hear is the power supplies for the pump lasers. The chugging noise that you can hear, kind of like an old man wheezing, that's the cryocompressor. The titanium doped sapphire crystals in the laser that we use have to be cooled down to cryogenic temperatures with helium pumped around them. Most of the vacuum pumps, we keep underground to try and keep the noise level down a lot. Ben - There's a lot of kit in here that I couldn't even begin to understand. What are each of these machines? Emma - At the back of the room over there, we have the laser system, it's an ultrafast laser system. Then we have two tables full of optics to generate much short pulses of light by focusing the light into a hollow fibre filled with gas and also to generate light across the wavelength range from the UV to the mid-infrared. The idea is that we can use any combination of these pulses as a pump to initiate a change in a molecule of solid for instance, or to generate x-rays, and then another laser pulse to probe, at a later time, what's going on in the experiment. Then we have a whole series of vacuum equipment. So a vacuum chamber where the x-rays are generated. The XUV can only propagate in vacuum so we have a series of vacuum chambers to monochromatise the light, filter it, and refocus it down, and the experimental interaction stations at the end of the beam lines. Ben - So, the interaction stations are where scientists can go and actually get to do some science with all this amazing kit. Emma - Yes, indeed they are. So we have two. We have one for materials science, for people looking at experiments in condensed matter. We have a couple of groups who are interested in highly correlated electron systems which are the kind of materials that high temperature superconductors are made of, and people interested in ultrafast de-magnetisation. 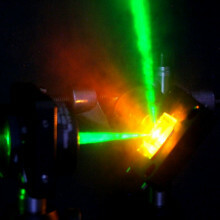 So, using lasers to switch on and off the magnetisation in materials and see how fast that changes. That's the kind of things they do in the material science. We also have a group in at the moment doing an experiment on our station for gas phase experiments looking at small clusters of helium. Klaus - My name is Klaus von Haeften from the University of Leicester from the Department of Physics and Astronomy. I'm investigating a very basic effect in condensed matter physics and gases and liquids. So we want to find out how molecules that rotate, how they couple to their environment and how the environment slows their rotation down. Ben - Is this a pure physics problem or are there some applied examples that we could think of? Klaus - There's no direct application but the problem is relevant not only for physics, but also for chemistry and biology because molecules play a central role in everyday problems. We have chemical reactions for example and chemical reactions depend on how molecules are aligned to each other and as the molecules rotate, they get misaligned, and dragged in different ways, so we need to understand this. Ben - How are you using lasers to actually study this? Klaus - Well it's difficult to see how molecules rotate for two reasons. One of the reasons is that they're very small and secondly they rotate very fast. So, we need a sort of microscope and the laser light acts as this sort of microscope. The lasers here are particularly fast and they allow us to track the rotation of the molecules. Ben - So, you fire a laser at a molecule very, very quickly. I'm assuming in very, very short bursts. How do you then pick it up and what can that tell you? Klaus - Well the trick is to use two laser pulses and to have one as a reference and to fire the second laser pulse with a delay time between the two and we control this delay time and see how much the position of the molecule has changed with this information on the rotation that they want to get. Ben - And what's going to be the next step? Once you've collected that information, what do you do with it? Klaus - We have to think and analyse the data and we need to develop some finer theories for that. This is a true cutting-edge experiment because we have preliminary data that tells us that this effect exists but has never been observed before or seen before. So, it's very difficult to answer this question because it's something never done before, so how can you predict what happens in the future? We will look at the data and we have theoreticians in the team who are smart enough to develop ideas. 49:17 - Can all forms of radiation be used to make lasers? Can all forms of radiation be used to make lasers? Harry- Most forms of electromagnetic radiation can be used to make some kind of laser source. 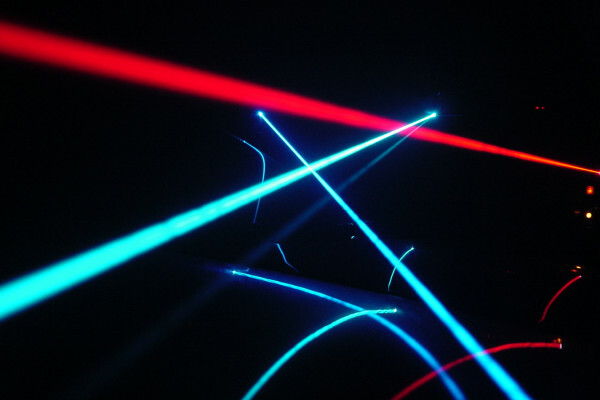 In fact, the first laser ever made was called a MASER. It was Microwave Amplification Stimulated Emission of Radiation. So it worked in the infrared. Chris - Could you, Nic, use other wavelengths with your technology if you needed to? Nic - Yes, absolutely. You could most easily extend it to use either infrared or ultraviolet, and be our current device actually uses a liquid crystal cell to modulate it, it's very closely related to the COSMOS idea. You just change the pitch of the liquid crystal cell to adapt it. Chris - Would that work with your technology then Philip, you could tune your thing up? So even though you're currently using crystals with visible light, you could go into other regimes that we currently can't see if you needed to. Philip - Yes. With the liquid crystal approach, the "twist" I was talking about earlier, that can be used to reflect light of any wavelength. In our particular system, we use organic dyes which emit and fluoresce in the visible spectrum. So you'd have to change the light emitting component but the liquid crystal part certainly would work for other wavelength regimes as well. 51:08 - How to laser tweezers work? How to laser tweezers work? Philip - There's a considerable amount of work that's being done at the moment, most in laboratory situations, where they can actually use light to trap small microscopic particles. There are a number of different ways you can use it. There are various gradient forces that can be imparted onto optically transmitted materials, so small pieces of glass if you like, and they can be actually attracted to the regions where the light is the brightest. So if you imagine a laser beam is brightest in the centre, the small glass particles will be trapped at the centre of the beam. I can use that to manipulate not just glass particles, but cells and things to move around and perform experiments with them. Chris - A colleague of mine at Cambridge University Vet School, Claire Bryant, is using laser tweezers like that to skewer bacteria and feed them to cells that eat bacteria to see how actually cells interact with pathogens. Exactly the same process, not just glass beads. Philip - You can use it to perform experiments on individual cells and things which you can't really do in a normal environment. 52:16 - Can lasers be made to curve without a prism? Can lasers be made to curve without a prism? Nic - In free space, the laser has to travel in a straight line. But as soon as you introduce curving in the medium - so imagine a laser going a liquid crystal cell which had changes in its refractive index as it went through - that would cause it to bend in the same way that a lens could make it bend. 52:42 - Could lasers replace military weapons? Could lasers replace military weapons? Harry - The Ministry of Defence made a matchbox-sized infrared laser in mid-1980s. You could just push a button on the top of the matchbox and watch a flame appear on the wall, 5 or 6 feet away. I should say, our lasers are not designed for this! Helen - So they had a go at it in the '80s but it doesn't seem to be actually being used at the moment. Do we have any reasons why that might be? Harry - Well they might be but we may not be being told. Remember that most of the aircraft flying in the various conflicts around the world use laser ranging to target bombs and God knows what else - missiles I guess! But always remember with light, it's going to diffract out eventually so you're going to lose intensity. I would guess that these could be used for short range but not long range. 53:53 - Why does laser light appear granular? Why does laser light appear granular? Philip - I think what he's asking about is a phenomenon known as laser speckle which seems to occur on most lasers when they're propagating through space. If you shine a laser beam onto a wall, you'll see this speckling effect. It's a time varying phenomena due to intrinsic noise in the laser beam and it's interfering with itself, and it's a property that's unique to coherent sources of light so it only occurs with lasers. Chris - Mike mentioned that lasers shining on skin produce a speckly pattern. Is that similar? Philip - Yes. The surface of your skin, at a microscopic level, is quite rough. Light which strikes this surface will reflect and scatter in all sorts of directions. All surfaces will have a degree of speckle but skin especially so. 54:47 - Which is the most realistic fictional laser weapon? Lasers are the favourite weapons of the fictional supervillian, whether torturing spies or vaporising whole planets. But which fictional laser was closest to the truth? Which is the most realistic fictional laser weapon? John - One of my favourite laser scenes in films is in Goldfinger where James Bond is strapped to a gold table and a laser beam is seen to cut between his legs, inching closer to his nether regions while Goldfinger says, "No Mr. Bond. I expect you to die." High powered lasers are used quite extensively in industry for cutting materials, for example, the metal panels of cars. So that rather eye-watering moment is actually quite plausible. In reality, the lasers are focused with a lens that's quite close to the surface of the material which is to be cut, so as to concentrate the energy into a small region. So, the beam that we see slanting in on the table is not particularly realistic but still pretty fun.Martin - You have to have a laser at a wavelength where tissue absorbs that particular wavelength, that particular colour. So, if you have a red laser, the main absorber in tissue around that frequency is haemoglobin and haemoglobin is red. In other words, it transmits in the red. It isn't absorbing the red. So using a red laser to cut someone in two is dreadfully inefficient.Hannah - So Goldfinger, top marks for your realistic use of lasers but if you'd like to frazzle Bond's bits more effectively, we suggest that you decrease your beam length and change your laser colour. Going back to John with his second favourite laser film of all time and there appears to be a theme here. It's Austin Powers in Goldmember in which Dr. Evil straps lasers to the heads of sharks or even sea bass. John explains...John - There's absolutely no reason why you couldn't make a laser waterproof and indeed, underwater lasers are used for imaging and communications. I think the real credibility issue there is the power of the laser shown in that film. The beams that come off them are seen to demolish parts of Dr. Evil's lair. There's totally no way that you could make a high-powered laser small enough so it would fit even on a very large shark's head. The most powerful lasers in the world today, the NIF Laser in the US and the Falcon Laser in the UK, are building size. We're talking big buildings here with lots of space taken up by the power supplies and the technology for energising the laser. But I guess there's no fundamental scientific reason why they couldn't be miniaturised in the future perhaps based on new technologies. Just look at what has happened to computers, which also used to be building sized. By the way, I thought it might be interesting to note that Dr. 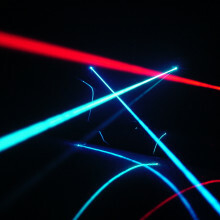 Evil's using of the word laser with exaggerated hand quotes is frequently used in laser labs around the world. So it's finally cool to be a laser scientist. Next Are insecticides painful for insects?